A friend of mine was wondering about Malekko mini boxed fuzz and forums told us that the unit was apparently just Univox Super-Fuzz clone in A-box. With our favourite methods, there is not a snowball's chance in hell to fit this in A. There's already Mark's original layout in the library, but i redrew this so it can be fitted in 1590B box instead of BB. 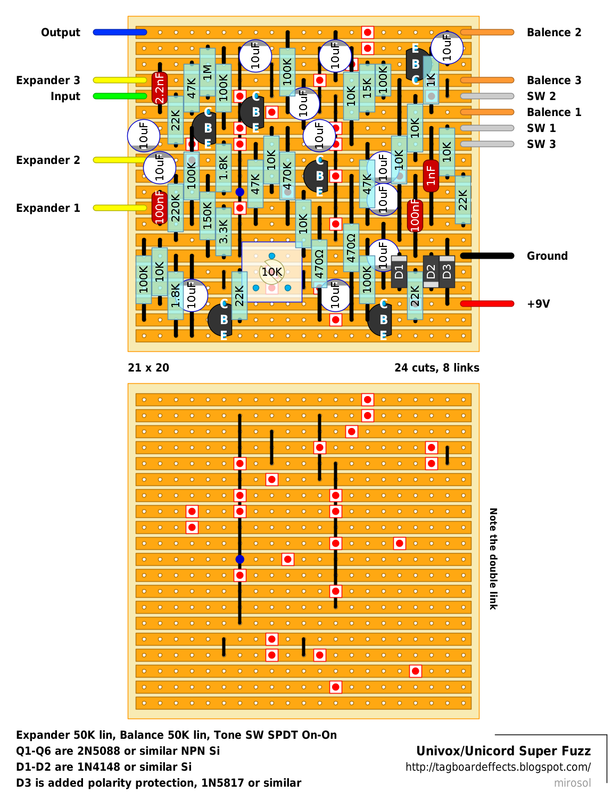 This layout is per the factory schematic found on Univox.org. I swapped the transistor pinouts for modern ones so that 2N5088, 2N5089, MPSA18 and similar can be used. There's added anti-popping pull-down resistor at the input and a polarity protection for your convenience. Layout is now fixed and verified. Happy building everyone! Just in time :P I was ready tio mark the holes. Waiting for your comments! Yup. If you take the top lead of the trimmer one row lower - it'll work and sound right. Sorry for all the hazzle. Now it's finally correct. If the file you have doesn't have "24 cuts, 8 links" on it, then it's the older one with errors. Damn this sounds cool. Like very high gain distortion/fuzz hybrid with sick up octave overtones. The trimmer does change the overall tone, but not enough that i would take it outside. All the controls work well and the tone changes a lot with every single change to the settings. Great fuzz. So can we consider it as unverified, I suppose? Javi. Yes. Until someone builds one with the fix :) I'm quite certain that the current layout works, but i'll still wait for someone to build it as it is now. Damn it sounds good. Probably the tightest fuzz i've ever played with. Not much noise content either. You'll rule as an elf!!!! Luckily, Murphy and his law was nor present yesterday and I was able to get the Spongebob's Pineapple House after just a two hours pilgrimage in Madrid downtown, so, my job as Santa's elf was a success too! Nice! I'm gonna build this thing up some time after the christmas holidays. Thanks a bunch for the layout. This schematic with all parts is sitting on my desk for over 3 months. Maybe this is a good time to start building it as it is now in a tighter layout. I have such high expectations from this one. Tony Mcphee's Ground Hogs played through this baby on Split and other great albums. The sound is just so crazy that I had to try it out. I have to meditate for 3 days before diving into circuits this size. Having a Superfuzz inside a 1950B is awesome! Great work mirosol! One last thing to add to my sound description - With the filter on (the tone switch, i mean) it has some qualities that remind me of Boss MT-2 Metal Zone :P It surely does not sound like a Metal Zone, but there is something quite similar in there. Any chance we can get a bill of materials for this motha? You're correct on this one. Posted the fix. Well, I'd say: Tag it! But have to tell that in my build, even thought it sounds goos, pots are responsive, and so on, I'm afraid that I have a dodgy cap, as when y play, sometimes sound comes and goes, let's say: sound gets faded slowly and comes back after a few seconds. Anyway, when it sounds, the effect is great, realy wild fuzz, hope to get this damned cap soon. Hope you can find the dodgy cap! I bought 60 x 10uF multilayer ceramic caps a while ago for not a lot of money but the seller doesn't seem to have any left. But if anyone does prefer the idea of using mlc caps instead of electros then this is a great kit. I used tantalums on mine. Except for the power filter, which is standard aluminium. Had to get my hands on the signal injector, luckiliy is just on very rare situations that I need to use it. Well, from Q2 to the end of the circuit the sound is ok, you get the different changes in tone from q to q, the trim does the work and so on. But when you inject signal on Q1 collector, the sound fades and the effect gets no sound, when you take the injector apart, the sound comes back, so, the problem must be on parts. Leaving Q1 socket empty, and injectin signal on the holes, the sound is not cut. One more thing that I have seen is that when you get voltages, on Q 1 collector, the voltage slowly rises until half a volt more than the initial measurement, from 4,7 to 5.18 (battery 8,95 volts). Q4 and Q5: Collector should bias about ~3,1v. If you put only Q4 on the board, collector is correctly biased at 3,18v. As soon as you insert Q5, the bias for both trannies, get down to 1,4v. If only Q5 is placed, it goes too to 1,4v. Never had this problem before: 10k resistor from +9v for both collectors and same row, and getting different voltages depending if you put one or two trannies. So, defintelely VERIFIED :P Sounds like a charm, really exciting fuzz. I've listened many supposed "high gain distortions" that look like a TS8 compared with this Superfuzz. My recommendation: try with 2N3904, this circuit likes lower hfe trannies. 2n5088 sound great but prefer the 3904. MPSA18 is absolutely overkill. I've tried some BA243, silicon with very low voltage drop od about 5,5-5,8 volts (higher than germanium, but lower than usual silicon), and the work quite well. 2N2222 should be perfect for this circuit! I built one of these using IvIark's earlier posted WIDE layout with all NOS 2SC828 transistors. I modded mine with a scoop control and a frequency select for the mid scoop freq. it sounds great! i had to use a 1590BB enclosure with the wider vero (but I don't mind that a bit). it's been awhile since I built and modded it so i'd have to tear it apart to see what I did. I just did it on the fly and didn't make any notes about the mods. Hi, I've just finished this one and get the same problem as Javi - really low volume, farted fuzz sound. I think I am working off the changed layout but just to be sure can you tell me what was changed so I can check? Cheers! -Flarty sound and low otput: A bad solder on Q1. After fixing the solder, I had the second problem. After these fixes, the Superfuzz sound really loud and powerful, a really nasty (in the good sense) fuzz, in fact, has become one of my favourites! Got it done, was missing one of the 10uf caps. Schoolboy error! Sounds amazing, my favourite fuzz so far! I want to build one but i have some questions (i dont have so much experience building pedals, big muff pi is the hardest board i built). Please help! If yes, do i need a special machine to adjust ¿bias?? or i have to adjust it on-the-fly (pedal turned on and adjusting the screw until it sounds ok)? Is this bill of materials ok? The bill of materials looks ok but I would strongly recommend getting at least one spare of every value (preferably more than one spare). You will be very annoyed if you buy the exact quantity you need and then damage a components during soldering and have to go and buy more to finish the project. which you can use to socket the transistors. Thanks for the help! Just a few more noob questions, which kind of resistors should i use, carbon film, metal film, carbon composite...? Camp. you can use any of the 3, the difference is the material they are made of, which alters the % variance. Personally I would suggest metal film, and carbon film if the value you need can not be found as metal film. Metal film usually help prevent a lot of outside noise and are very reliable when it comes the the values, ie: if something is marked as a 10k it will be no lower then 9k and no higher then 11k. There are a lot of people that argue over whether or not specific materials used to made specific parts affects the sound, but I have not found much of a difference, if any in the material for resistors and capacitors. The greenies, and electrolytic caps are fine, and I would avoid the other two. I've build tons of pedals with cheap greenies and they sound fine, the issue is the height and width of them when they are large values. You have to remember that depending on the size of the enclosure, and closeness of the parts in the circuit you have to be wary of capacitor sizes. Also, as long as the voltage rating for the components is above the voltage powering the circuit you will be fine. Most of my electrolytics are rated at 50V, and I have a lot at 35V, to help keep the size of them down. I would post some sources of parts, but I'm in the US and not sure if they would help where you're at. Also, look on the DIY stompbox forum, there is a ton of info there on beginning building, and check the forum here. I have learned so much just by reading others posts, and don't be afraid to ask questions. There are some many guys here that are ready to help and provide direction. I know without many of the guys here, I would not know what I do, and would not be able to do what I've done. I don't want to name names, cause I know I will forget someone and don't want to seem ungrateful. This thing rocks man. My favorite fuzz yet, I always wanted a superfuzz. I used 4 bc109's a 2n5088 and a bc550. Im happy all my electrolytics were good. This is a great layout and adds the 10k trimmer for controlling the octave fuzz. Any chance of adding the extra modified layout which adds on top of the octave control trimmer the Tone and Clipping mods? 2. diode clipping switch and trimmer control. what does that blue dot mean? is that the point where the double link is? Yup. That's where there are two links in one hole. Don't know why but the Q4 Q5 issue really got on my "internal strings". The pedal sounds amazing without Q5 and when I insert it back in it starts giving that octave sound. The problem is that the pedal actually sounds better without the octave thing. The octave makes it a bit gated and chords are too squashed and the overtones are so strong that you really get all sorts of harmonics that are a bit annoying. I'm thinking of adding a switch for Q5 (or Q4 it doesn't matter). I also added the 10k pot betweeen Q4 and Q5 and matching them didn't help. I know that no one has posted on this build in a while, but which are the 2 trannies that effect the octave that I should be aware of when it comes to matching to avoid gating and such? I've built a couple of these using both of the layouts here and I love them but I'm looking to modify this a bit to taste and am hoping for some help before I start playing with them all. I've messed with this circuit a bit but some direction would be great. Thanks guys, and another solid thank you to mark for the never ending line of layouts and exposing some of the "builders" out there that are trying to make a pile of money while you, Miro and others do this for the sake of doing it. It really is amazing and I've learned more from doing this than from all of the reading I've done anywhere else. Q4 and Q5 are crucial. Correct biasing will get you that great octave up thing, but chords will sound too harmonically rich for me. I used a 10k trimmer between them to match them better as suggested by several DIY veterans. Btw, it's OK to make money building pedals. Getting parts, etching the PCB, enclosure, pots, knobs, good true bypass wiring, artwork and support is something that costs money. We all know how much money and time we spend on building them pedals. It's OK to charge a reasonable amount for a good clone or a good sounding pedal. It's OK to overcharge for something which nobody else has. ha ha...It's NOT OK to charge a shitload of cash for an unoriginal simple circuit that goes bzzzzzzz. I'm currently troubleshooting a failed build of one these and was hoping for some tips if poss! When using an audio probe, I get sound from the input up until the base terminal on the first 2N5088, but nothing from the collector or emitter. Should I expect to hear something at these terminals with the probe too? If so then I can probably assume this transistor needs replaced. Any suggestions on how to proceed gratefully received! All measurements from the above were taken with no input signal being applied to the circuit (I'm not sure if this is the correct way to do things however). ps. With the "Expander" pot turned fully anticlockwise and the Balance pot turned fully clockwise, the circuit appears to pick up radio signals. I am testing using a Ruby guitar headphone amplifier which I've never heard radio through before. 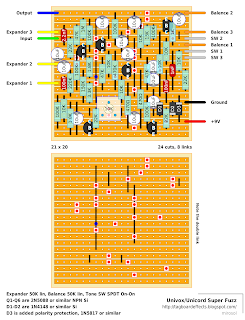 OK, I slept on it, studied my own words carefully and got a hold of the original Univox schematic. After working backwards from the suspect transistor I found that the 47K and 470K each had one of their terminals in the wrong position. After fixing them, all is well! Sounds amazing - even using my <100GBP strat through a headphone amplifier. I built this today, sounds badass! I'm not sure but I think D3 (polarity protection) is supposed to be connected to ground. Thanks for the sweet layouts! Nope. That would be the case if the protection was wired as parallel diode protection. We have a tendency of either omitting the protection altogether or swapping it for series protection. With parallel protection (anode to ground, cathode to supply) the reversed polarity will burn the protection up and in most cases short the circuit up until fixed. In same cases the diode may blow up, burning a a chunk of the board useless with it. With series protection, the only caveat is the 0,2-0,5 Volt voltage drop, which will have inaudible effect on the circuit. But once this protection receives the wrong polarity, the circuit won't simply work. At all. Nothing burns up or gets shorted. So, if a polarity protection is added or used in our layouts, the chances are this is done with series protection (supply to anode and cathode to circuit +V line). Like in this case. Nervermind, one bad transistor. Now it sound amazing! I ended up using OA1160 diodes both with fv of 32 and 2N3904's for the transistors. Not one of my cleanest build but the bottom line. It WORKS. How do you wire the tone switch up? on the layout you have 3 wires that say sw1,sw2,sw3. you take those and you wire them on the tone switch. I used 2n3904 transistores. The problem is the bypass works fine but when engaged the effect it drops the volume to almost no audible. I measure the transistor and gave me this, hope u can help me!! By the way i numbered the Transistor left to right being Q1 near 2,2nF and Q6 the in top right corner near the balance wires!! I built this fuzz as my first project ever. I have the problem that seems to be common to some other users. Once effect is engaged the output level drops significantly and only cranking up the amp to max makes this effect output signal audible. I did lot of troubleshooting f.ex. replace electrolitic caps, replace transistors but problem still persists. I would be appreciated for any ideas. Triple check your germainuim diodes. If those leak too much the cause could be there. You could probe them at the right hand side, fourth row from the bottom. I've replaced those for standard 1N4148 in my builds and it's my main lead pedal. May not be all that loud, but still clearly way over unity with modern high(ish) gain pickups. In a sense, if your signal is loud as F at the two bottom transistor's collectors, but not at the Ge diodes bottom leads, then your issue is with those diodes dropping too much of the signal to ground and thus - lowering the output level too much. Big thanks Mirosol for Your reply!. I will check all diodes as You wrote. Thx again! Louder. "May not be all that loud, but still clearly way over unity with modern high(ish) gain pickups". Finally I fixed the issue with low output. I replaced all transistors, capacitors (electrolic + foil) and diodes without success. Than I measured resistance of balance pot and it was damaged. Despite of pot turning it has always one resistance out of pot range (pot is rated 0-50kOhm whereas its resistance was about 400kOhm) After replacement the effect behaves perfectly. Nice lovely sharp fuzz sound. Thanks Mirosol for Your support. I appreciate a lot the support available on this site - impressing!!! Finished this yesterday, worked like a charm. I used 2N5088's Q4 and Q5 matched at 595 HFE and 1N60 germanium diodes and it really sounded good, nice octave. It has a much higher gain than a kit I got from General Guitar Gadgets (first pedal I ever built) which used 2N2222's. Thanks for the layout! Quick question. I am getting ready to have a go at this and I have a bunch of 10uf non polarized greenies can I use them in this build or should i stick to using the 10uf electrolytics? Built this like 6 months ago and finally boxed it today. I just KNEW it wouldn't fire up--I have a pretty bad track record with boarda this big. IT'S ALIVE! Sounds just rrrrrripping with 2n3904s, so I can't wait to mess with other transistors. You did it again, guys!!! really low output and farted sound... that is my first pedal so i must have fked up somewhere... gonna check... anyone that had this problem fixed it? it was a bad potentiometer. the balance one. great pedal! thankssssssss!